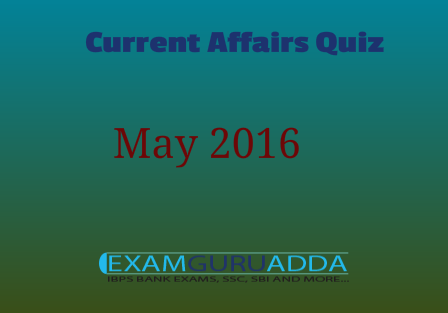 Dear Readers Examguruadda.in presents Current Affairs quiz of 15th May and 16th May 2016 that cover important current affair events. Current Affairs quiz prepared according to the latest Bank, SSC and other competitive exams. 1. Who will be honoured with the International Astronautical Federation (IAF) Hall of Fame Award for 2016? 2. What is India's rank in global organization EY released the Renewable energy country attractiveness index 2016 ? 3. The 2016 International Day of Families was observed across the world on.......? 4. Who became youngest winner of F1 at Spanish Grand Prix? 5. Which has successfully launched Yaogan-30 remote-sensing satellite into sun-synchronous orbit (SSO) using the Long March-2D rocket? 6. The Aguada Central Jail is located in which state of India? 7. The multilateral Red Flag Aerial combat exercises between US, NATO and allied forces and India Air Force (IAF) concluded at which place ? 8. Who has sworn in as the 31st Chief Justice of Rajasthan? 9. India’s first Spice Museum will be opened in which city of India? 10. India’s first startup hostel has been launched in which city of India?